One-third empty or two-thirds full? The British Beer & Pub Association (BBPA) is optimistic that another serving-size option for draft pints will revive an industry whose market share is wobbling under the influence of wine and spirits. British law has long dictated that pubs sell beer and cider only in an imperial pint (pictured), which is about 20 percent larger than a U.S. pint, or in glasses one-third or one-half that size. But this year Parliament is set to scrap several restrictions on weights and measures to encourage innovation. 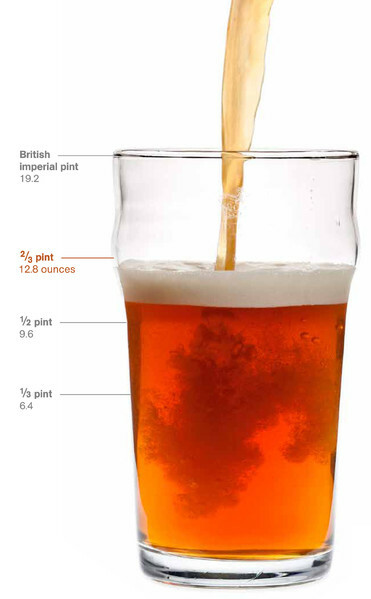 This would legalize a two-thirds pint—an amount some are calling a schooner based on a similar-size Australian pour.